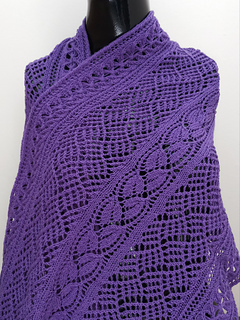 This rectangular-shaped wrap features a central panel of a dayflower stitch pattern surrounded by mermaid mesh lace and running edges of a honeybee pattern. 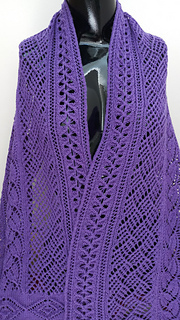 The end of the shawl adds a final section of Shetland lace diamonds as a bit of a surprise. 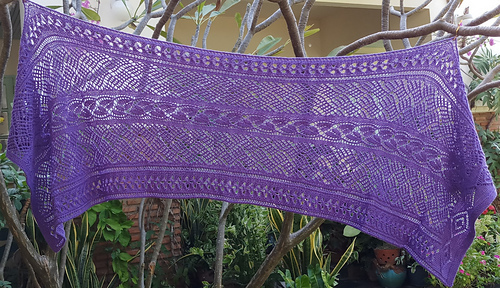 I used just under 2-1/2 skeins of Cherry Tree Hill Supersock solids (merino) in purple, or 1,050 yards/960 meters, to knit a wrap that measures 68in long x 20 in wide (172 x 50 cm). The shawl can easily be made shorter or longer by the number of pattern repeats you knit (with US4 (3.5mm) needles, 1 pattern repeat yielded approximately 7 inches. The instructions are written out, row by row. You’ll need 4 stitch markers, and although I seldom use them, you’ll want to use with this pattern.